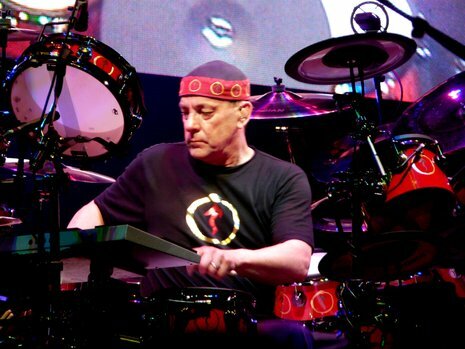 Neil Peart (pronounced /ˈpɪərt/) OC, (born September 12, 1952) is a Canadian musician and author. He is the drummer and lyricist for the rock band Rush. Peart grew up in Port Dalhousie, Ontario (now part of St. Catharines) working the occasional odd job. However, his true ambition was to become a professional musician. During adolescence, he floated from regional band to regional band in pursuit of a career as a full-time drummer. After a discouraging stint in England to concentrate on his music, Peart returned home, where he joined a local Toronto band, Rush, in the summer of 1974. Early in his career, Peart's performance style was deeply rooted in hard rock. He drew most of his inspiration from drummers such as Keith Moon and John Bonham, players who were at the forefront of the British hard rock scene. As time progressed, however, he began to emulate jazz and big band musicians Gene Krupa and Buddy Rich. In 1994, Peart became a friend and pupil of jazz instructor Freddie Gruber. It was during this time that Peart decided to revamp and reinvent his playing style by incorporating jazz and swing components. Gruber was also responsible for introducing him to the products of Drum Workshop, the company whose products Peart currently endorses. Peart has received many awards for his musical performances and is known for his technical proficiency and stamina. Peart currently resides in Santa Monica, California with his wife, photographer Carrie Nuttall, and newborn daughter, Olivia Louise, but also has a home in the Laurentian Mountains of Quebec and spends time in Toronto for recording purposes.